Faced with an expansive backyard with no character and a rolling slope, the homeowners had a very simple objective: make the yard a party space. 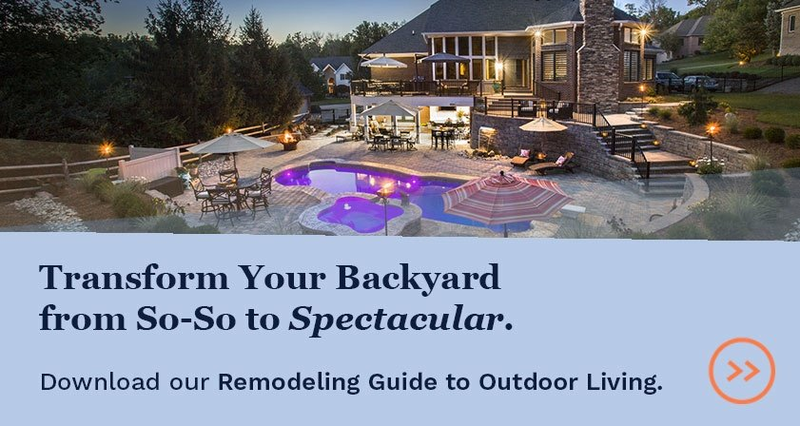 Beyond this clear objective, the homeowners had a wish list of key elements, including a pool, an outdoor living room, and lots of comfortable space for a crowd. The result is a space that takes full advantage of the back yard while keeping scale, space and views at the forefront of the design. The resulting transformation is a 2016 NARI Contractor of the Year Residential Exterior Winner. The property itself presented challenges that greatly affected any changes made to the back yard. A “greenspace limitation” runs through the backyard as a diagonal band that originates between the house and the neighbor, and crosses through the back portion of the yard. All landscaping changes had to avoid that area. 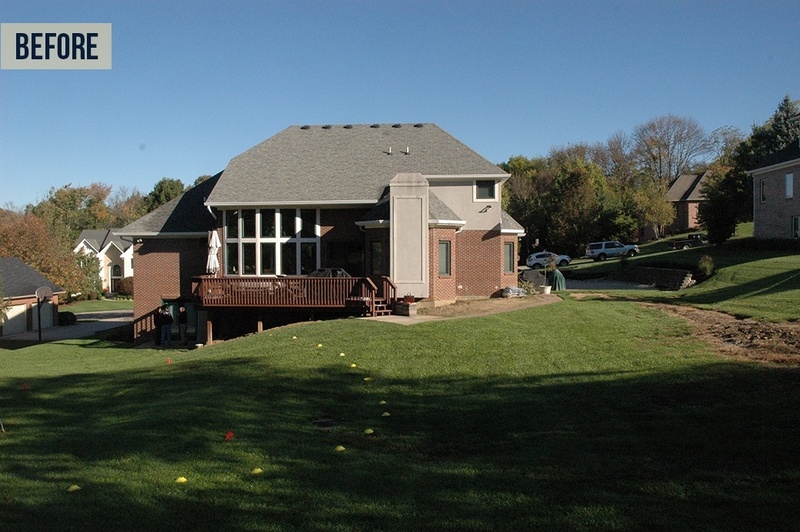 The yard’s slope was irregular closer to the house and flattened out further back on the property, but the homeowners desired the changes to be closer to the house for a cohesive indoor/outdoor relationship. 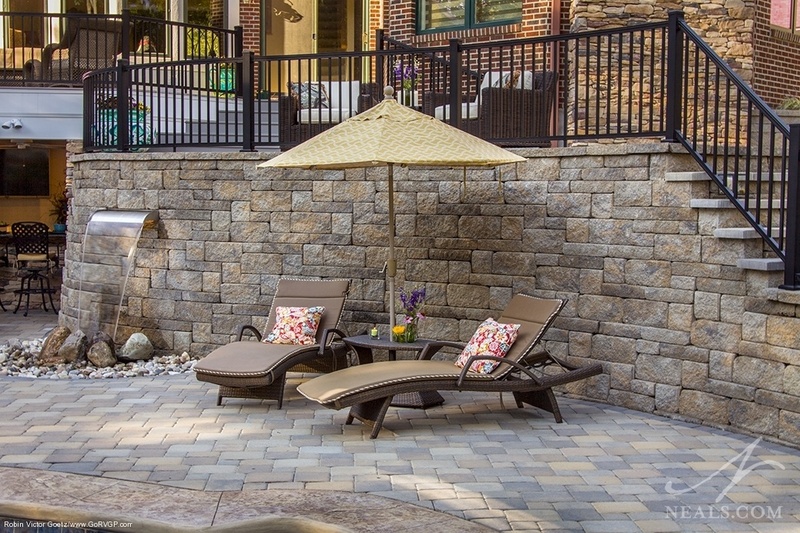 Rather than looking at a solution that took advantage of the yard’s slope, the approved plan called for the creation of a sunken patio at the basement level. This required massive excavation, but also caused the home’s foundation to be exposed above the original freeze line. The patio was set lower than the house to provide headroom under the proposed deck. 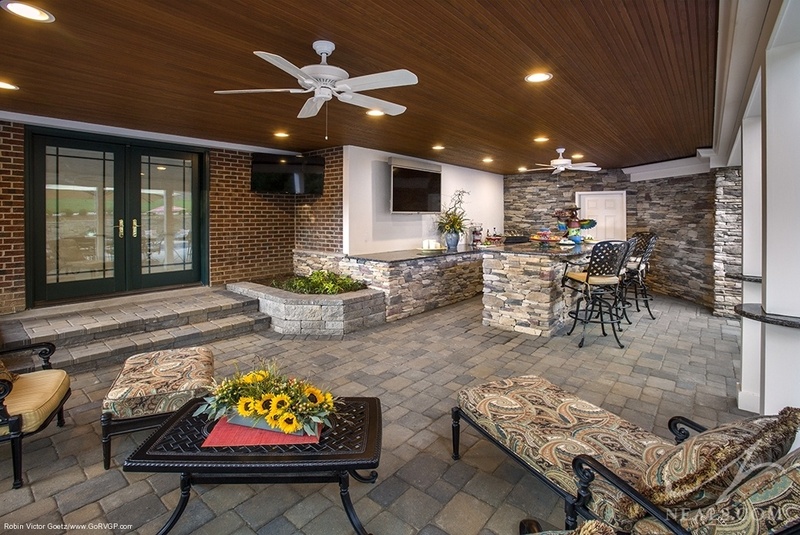 The homeowners knew that they would add an enclosed grill area to the new upper deck at a later date, so all the structural needs for an addition to the deck level had to be installed during this phase of construction. The entire space needed to feel open and spacious without the sense that the patio is set very deep in the ground, so keeping the height scales and resulting views in check was a crucial factor. Along the exposed section of the foundation, a series of features were included to accommodate frost protection for the footers. A wide set of steps flanked by faux planters was set up at the basement door. The planters are filled with dirt. The homeowner uses the planters for plant display. In the serving area, a long buffet counter was installed that suits the homeowner’s needs during large gatherings. Behind the stone facade, the counter base is also filled with insulating dirt. This combination of solutions solved the foundation issue with clever aesthetics, and achieved a great ceiling height of 10’ under the deck. 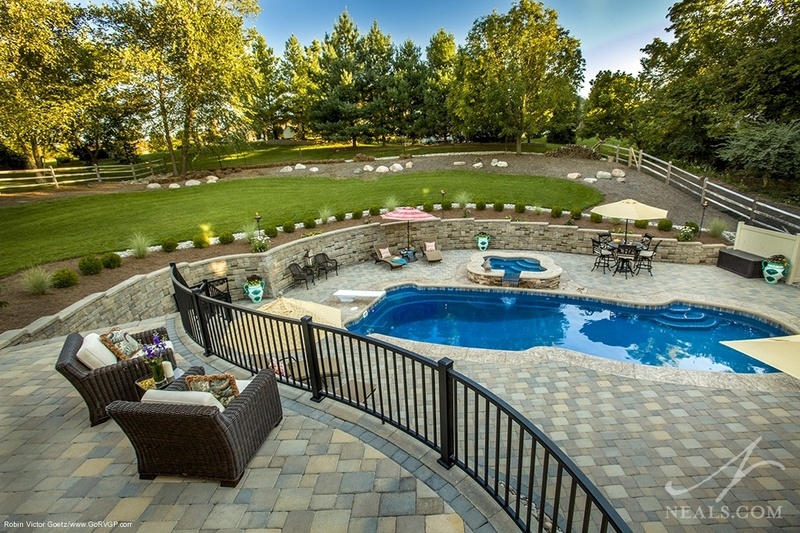 The homeowners preferred the organic flow of an English-style landscape, so curves dominate the new hardscape elements. The biggest of these is the long retaining wall holding the hillside back. Here, the challenges of scale and the homeowners’ desire for comfortable entertaining space had the most impact on the design. While it would have been tempting to simply follow the green space limit’s boundary and flatten out most of the back yard, doing so would have created a retaining wall that dominated the views from the house. Instead, the plan sought to balance the need for space around the pool with how much of the sloping yard was retained at the back of the property. Behind the retaining wall, several columns of drainage piping and gravel layers prevent water and mud from seeping out through the wall. 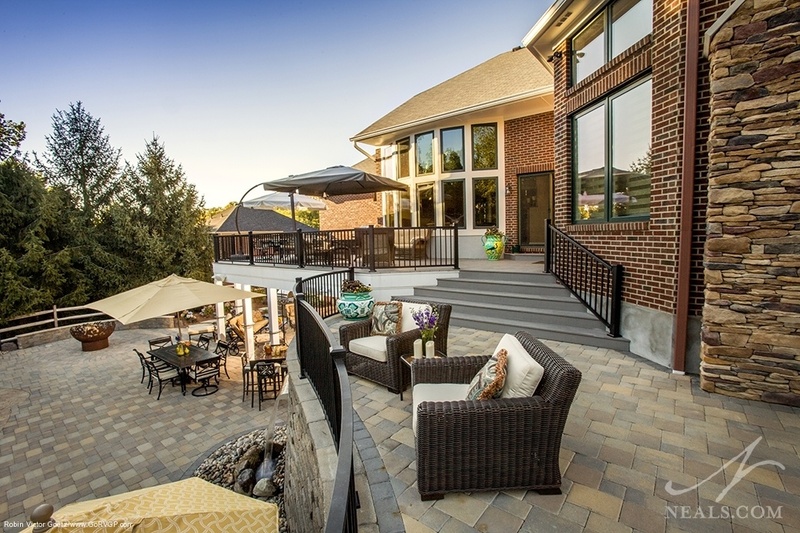 Our local landscaping partner for this project was Werbrich's Landscaping. The main entertaining space comprises the ground level, where guests can move from the interior basement out into a covered area containing the outdoor kitchen space and a spacious seating area. Then continuing out to the pool and patio, guests can follow the grand staircase up to another patio area that serves as a landing between levels and is a point of entry from the side of the house. The final level is a new deck with additional seating and interior access. The deck was created with a custom drainage solution. Under the decking, waterproof panels collect rain and divert it to the gutters concealed in the deck border, which sends it to the downspout away from the main areas. The wood-finished ceiling is completely waterproof, and facilitates electrical needs for fans & lights. For added ambiance, the homeowners requested the inclusion of a waterfall feature. The retaining wall on the house side of the patio was chosen as the location, since it was a central spot where the sound could carry to all areas of the new landscape. Rather than just having the water pour into a pool or basin, the area was set up with loose stone and a few larger rocks to conceal the basin for a more natural look in keeping with the organic quality of the rest of the landscape’s forms. Another water feature occurs where the hot tub flows into the pool. 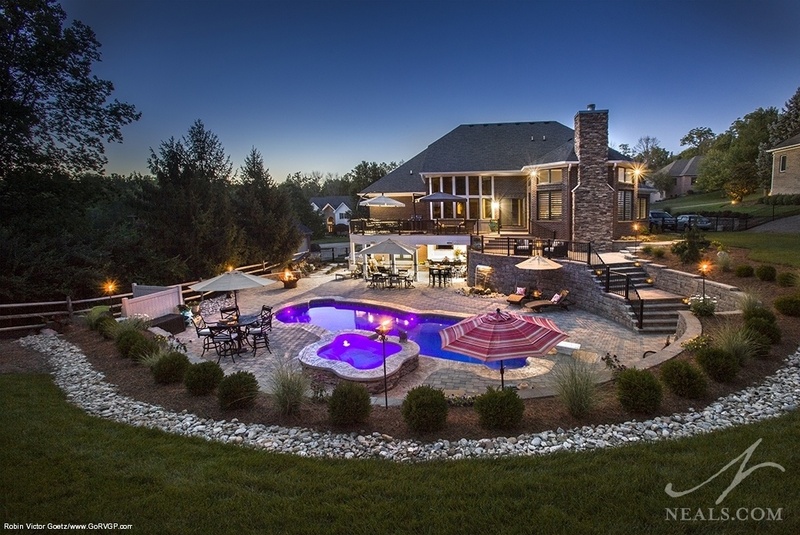 The hot tub was placed on the far side of the pool so that it offered a better view of the house elevation, rather than just the pool and retaining wall. 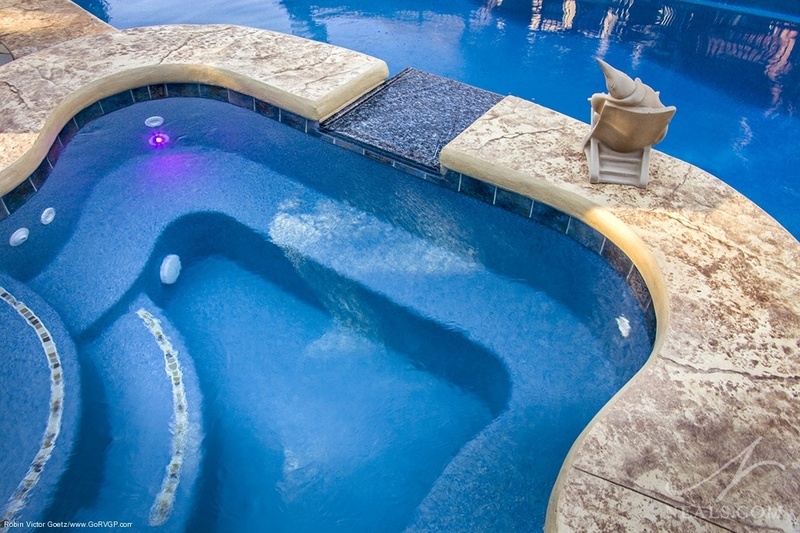 Both the hot tub and pool are single-piece units. Curvy, irregular forms were selected to create the asymmetrical look. Stained concrete was used for the pool and hot tub borders. The pumps and filters for the pool are hidden behind two fence pieces in the corner of the patio. All other plumbing and electrical needs for the pool area were installed under the patio. The homeowners purchased a firebowl for the new landscape. A section of the patio was designated for this feature, positioned away from the more active areas around the pool. 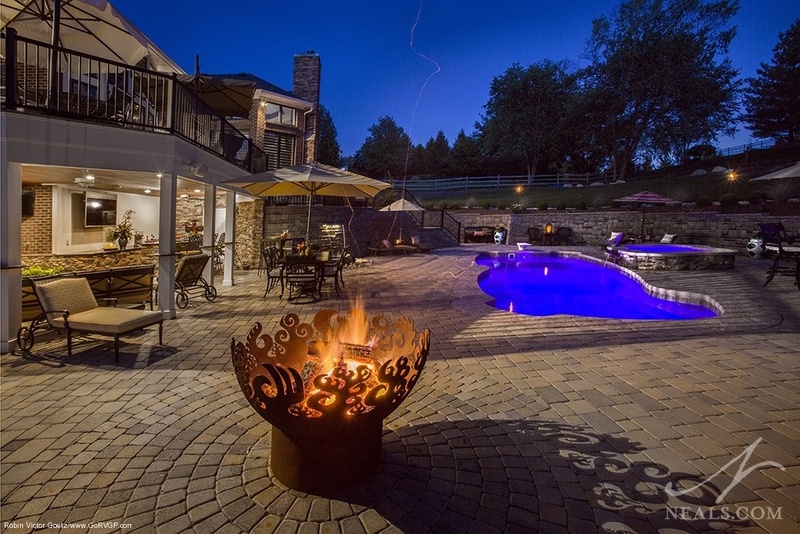 To highlight the unit, the pavers were arranged in concentric circles radiating from the fire bowl. This also helps to delineate the “fire zone” while keeping the patio clear of obstructions or material changes. The bowl is gas-powered, with a shut-off valve in the base. 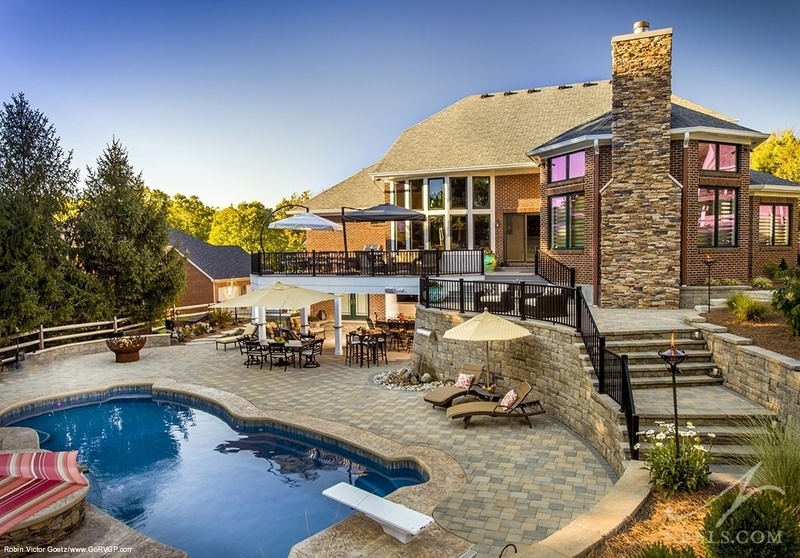 To add to the texture of the design, cultured stone facades were used in a handful of areas around the space, including the hot tub surround. Large stepping stones lead from the front of the house around the side to the landing patio with a few steps down. The whole space caters to social entertaining where guests are more likely to stand and mill around than sit for long periods. Drink ledges on the columns are one consideration for this. The deck columns are strategically placed for a forthcoming structure above without inhibiting flow. Need more inspiration? 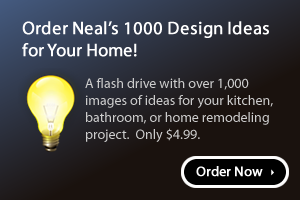 View other outdoor living projects by Neal's Design Remodel.